Defected Records caps a defining year with their final party of the year at London’s most iconic nightclub. 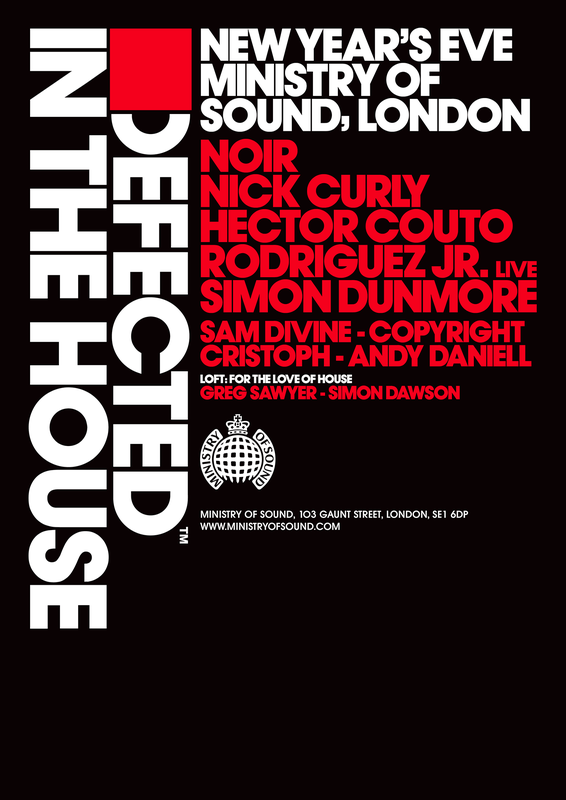 In 2014 Defected can look back on an incredible year of events, not least of all for their residencies at Ministry of Sound – a series of six parties, which has without doubt been the label’s finest season yet in terms of range of artists, level of performances and vibe throughout the club. 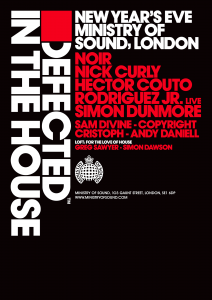 This New Year’s Eve, Defected In The House wraps up the year by bringing some of the world’s finest DJs to Ministry of Sound for the fiercest house music line up you’re likely to find. Staying true to the musical ethos of the label, The Box features a combination of long-associated Defected stars alongside some fresh blood. Returning heroes Noir and Nick Curly – fresh from sensational summer seasons – headline, alongside Hector Couto and Rodriguez Jr., both of whom are making their Defected debut. Of course, no Defected NYE show would be complete without Defected founder Simon Dunmore, who will play one of his legendary warm-up sets in the Box. Meanwhile, 103 is given over to the residents, Copyright, Sam Divine, Cristoph and Andy Daniell, all of who represent the core house sound of Defected that has placed the label at the very forefront of the scene. The final Defected curated room is The Loft, where the For The Love Of House DJs Greg Sawyer and Simon Dawson will be spinning classic house all night long, paying homage to the records that have helped define the scene over the past 30 years. Complete with four rooms of music, including the legendary main room, The Box, plus state of the art sound and lights across the venue, Ministry of Sound is a world-class space with 23 years of definitive New Year’s Eve events for thousands of like-minded clubbers. Jaymo and Andy George lined up for the launch of Satans Circus.